Note to readers: This is the second in a weekly four-part series about how to get the most out of your craft beer experience. If you missed the first article in this series, click this link to get caught up. Our second lesson in the art of enjoying great beer involves your sense of vision. For years the world has thought of beer visually as crystal clear, yellow in color and with robust carbonation streaming up the glass. While that presentation is great for many styles, it is not always how beer should appear. 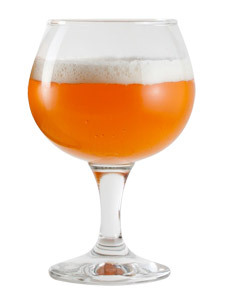 As you will learn, the way a beer looks can be influenced by style, temperature and even the skill of the bartender. Let’s take a look at each of these characteristics individually. Today’s craft and import beers run the gamut of the color spectrum from pale straw to golden, amber, copper, orange, brown, black, and everything in between. Dictated solely by the style of the beer, color is not an indication of whether a beer will taste good it is merely an indication of which malts and adjuncts the brewer used while making the beer. One color is not necessarily better than another when it comes to beer. It’s all a matter of preference. In the world of competitive beer brewing – yes, there is such a thing – judges use a style guide to determine the general color a given beer style should have. One of the most accepted and respected guide is the Beer Judge Certification Program Style Guidelines. This extensive guide catalogs how over 75 general beer styles should look, smell and taste. It is well worth a look if you really want to know all the details of how a beer should look in your glass. But, for the casual beer-drinker, we can simplify the color issue. Of course, there are plenty of other styles not represented on the above chart. Styles like Brown Ales that are, well, brown and Schwarzbier and dark lagers that lean towards the amber side of brown. But, for the most part, this chart should help give you an idea of how certain styles should fit on the color scale. In general, if the beer falls within the expected color spectrum of its style, the brewer followed good procedure and used fresh, quality ingredients. Beer that is far outside of the expected color for the style may still be good, but treat it a bit more cautiously in your expectations. Crystal clear or cloudy, that is the question. And the answer is a definitive; it depends. While the quest for beer clarity is a goal to most modern brewers, there are certain styles of beer that are inherently cloudy and that is perfectly okay. Historically, beer was rarely crystal clear. Indeed, the suspended particles were desireable because they are what made beer the nourishing drink that it was. Sure there were a few styles prized for their clarity like Pilsners and other German lagers, but the vast majority of beer was anything from hazy to outright cloudy. Today, for beers like Wits, Hefeweizens and other unfiltered styles a cloudy appearance is perfectly appropriate. In the world of beer tasting there is a phenomenon known as chill haze. When a beer is not boiled properly during and then cooled fast enough chill haze can set in. When this occurs and the beer is refrigerated, the proteins still in the brew are driven out of the solution causing it to take on a hazy appearance in the glass. While it rarely changes the flavor of the beer, it does make it less appealing to look at. Another cause of hazy or cloudy beer is the presence of yeast that has not settled to the bottom yet. Certain yeast strains are bred to have a high degree of flocculation or the ability to settle out of beer quickly. Others, like those used in Witbiers and Hefeweizens flocculate much slower and cause the cloudy appearance that is perfectly normal for those styles. Brewers will often store beer in a cool place or even refrigerate it to increase flocculation in yeast. A perfect example of this is the practice of lagering employed by the Germans who, in the old days, stored beer in caves for several months before serving it. The time spent sitting undisturbed in the lagering caves allowed the yeast to fall to the bottom of the barrel and produced a much clearer brew. Other particles that remain in beer for a long period of time include things like hop particles, fruit pectins and any other adjuncts that may be added. Beers like double and triple IPAs will often appear hazy due to the higher amount of hop residue that stays in suspension in the beer. Dry-hopping, a practice of adding hops to a beer after the original boil, also contributes to a decrease in beer clarity. To increase the clarity of beer brewers will often add materials like Irish Moss, isinglass and whirlfloc. They may also employ a filter or whirlpool the remove solids. For your enjoyment, though, just keep in mind that some beers are meant to be cloudy. 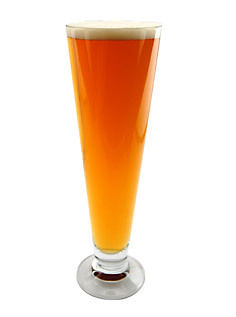 As a rule of thumb, wheat beers or beers made with a large amount of wheat in the grain bill are meant to be cloudy. Also, keep in mind that chill haze, while not attractive will likely not affect the flavor of your beer. For years the excepted standard of two fingers so foam at the top of a well-poured glass of beer was what all good bartenders strived for. Another tell-tae sign of good head is the lacing – known as Belgian or Brussels lace – left on the sides of the glass as you drink the beer. But, if the head did not form it is not always the bartender’s fault. There is a lot of chemistry and artistry that goes into brewing beer that will form and perfect, fluffy head. During travels in Belgium, I noticed a bartender mis-poured a beer. Before she would serve the beer to her guest, she made sure there was head on the beer by taking two coffee stir sticks and whipping one up. By doing this she not only saved an innocent beer from being wasted, but she also insured her guest got full enjoyment from his beer. The Belgians are fanatics about beer and would not dream of serving a beer without a proper head. But, why? The foam at the top of your beer serves a number of purposes; most importantly it captures and disburses aromatics that lead to an increased enjoyment of beer. But, it also provides part of the beers feel in your mouth and is an indication of the relative health of the beer. So, what kills foam? Soap residue in a glass and oils. Glassware used for beer must be impeccably clean, any soap or cleanser left in the glass can kill a foam head and leave a beer with a surface smoother than a lake on a windless day. Oils will do the same thing. For instance, lipstick and lip balms react with the foam a cause it to quickly dissipate. This is why the old trick of touching your nose and then sticking your finger in an overflowing beer or soda works. But, there are other factors to a rich head including the type and alcohol content of the beer. Just as Witbiers and Hefeweizens are typically cloudy, they are also blessed with glorious, billowy heads because of their high concentration of compounds that enhance foam production. Higher alcohol beers, on the other hand, generally have lower amounts of head. So, how can you insure the best possible head for your beer? Pour your beer straight down the middle of your glass. Sure, this goes against the steps given on the perfect pour instructions last week, but if head is what you want, this is how to get the most. The color of your beer depends on the style you are drinking and can indicate whether the brewer hit the mark for the style he was going for. Clarity can be an indication of improper boil and cool down procedures or, depending on the style can be perfectly acceptable. And, head retention can be affected by the cleanliness of your local pub or tap room or it can be an indication of the alcohol content of the beer. Next week: Ooh, ooh that smell! What effects the aroma and how it should affect your perception of beer. The Jax Beer Guy has partnered with the UBER car service in Jacksonville. Because of this partnership, you can receive a $20 credit for your first ride by simply using the promo code “JaxBeerGuy” when you register for UBER on your smartphone. Because we know that not everyone who reads this blog is a beer expert, we are starting a new four-week series to help you hone your beer-tasting skills. It is our goal to help you learn how to swill your brew with authority. 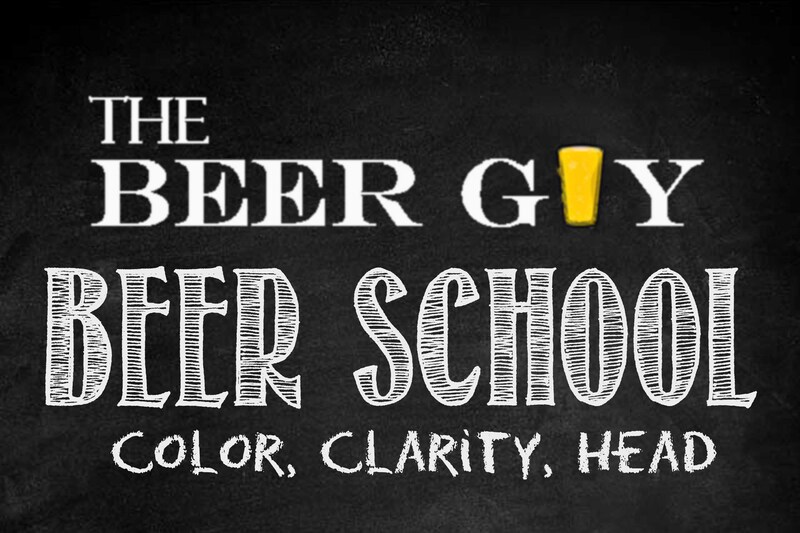 So, we present to you The Beer Guy’s Beer School! Because understanding how to properly serve your beer in integral to getting full enjoyment from it the first lesson in the series will address these important topics. Other lessons in this series will cover topics such as how to assess the quality of your chosen beer through the use of multiple senses including sight, smell and taste. In these lessons, you will find information on what you should be looking for in a beer, how it should smell and how it should taste. The first topic, as mentioned above is how to properly serve your beer. NEVER taste your beer directly from the bottle or can it came in. To truly savor your brew it is vital to sample your beer from the proper glass. Because of the many characteristics tied to the huge variety of beers, there is an equally astounding number of glasses that have been created to drink it. For most establishments, the common shaker pint glass is the preferred vessel for beer consumption. But, research – and tradition – may indicate otherwise. In Belgium, using the proper glassware to serve a beer is practically a religion. No self-respecting bartender in that beer-loving country would ever serve a Flanders Red ale in a shaker glass. No, these tart ales from the northern – Flanders – region of Belgium require a glass that will concentrate and intensify the aromas of the beer so the drinker can enjoy the brew fully. Proper glassware can be tricky, though. With so many glass styles to choose from, it can be daunting to figure out which beer should be served in a given glass style. Never fear, Beer School has a handy reference for you right here. Instead of purchasing dozens of glassware styles, concentrate on just a few that can be used to great success for several beer styles. 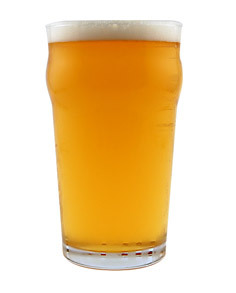 In America, the pint glass is the most commonly used glass to serve beer. While it is not the best suited glass for all beers, it is inexpensive and holds approximately 16-ounces of beer. The American shaker has straight sides rather than the pictured Nonic, or British-style glass. Beer styles this glass is most appropriate for include: British-Style Bitter, Pale Ale, India Pale Ale, Double/Imperial IPA, Amber/Red Ale, Brown Ale, Altbier, Porter, Milk Stout, Oatmeal Stout, Marzen/Oktoberfest, Pumpkin Ale, Rye Beer, Saison, Scotch Ale/Wee Heavy, Smoked Beer. The German Pilsner Glass was developed as a tall thin glass to showcase the beautiful golden color of the beer style. The tall shape also highlights the bubbles running up the inside and concentrates the fluffy, aromatic head. Beer styles this glass is most appropriate for include: Blonde Ale, Hefeweizen, Pilsner, California Common/Steam Beer, Japanese Rice Lager, Witbier. Snifters have a large bowl area with a narrower mouth. The bowl provides plenty of room for swirling the beer to bring aromas out while the narrower mouth serves to concentrate those aromas. Beer styles this glass is most appropriate for include: Old or Strong Ale, Barleywine, Double/Imperial IPA, Double/Imperial Stout, Belgian Dark Ale, Belgian Pale Ale, Quad, Tripel. Sturdy, yet elegant, the goblet is generally composed of a large, wide-mouthed bowl on a sturdy stem. Often these glasses are very ornate and may include gold or silver leaf designs. The goblet’s main purpose is to create a large surface area for copious amounts of aromatic head. Beer styles this glass is most appropriate for include: Belgian IPA, Belgian Strong Dark Ale, Berliner Weissbier, Dubbel, Tripel, Quad. These four beer glasses will accommodate the majority of beer styles adequately. But, if you are a purest and want to serve beer in only the most appropriate glassware, prepare to invest in hundreds of styles. NEVER pour beer into a chilled glass. 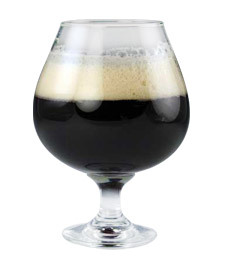 A chilled glass will cause the beer to foam too much when poured resulting in a short pour. Another problem with a frosted mug is that it may chill the beer too much, which you will learn later is a real problem for beer enjoyment. So, for best results, keep your beer glasses at room temperature . Hold the glass at 45 degrees. Pour the beer at the midpoint of the glass. Tilt the glass upright as you reach the midpoint of the glass. Finish your pour to create a one to one and one half inch head. If you end up with more than the optimal amount of head, you have poured too fast. Allow the head to settle a bit and try again on the next beer. Pouring beer is an art form and like all artistic endeavors, practice makes perfect. Now that you have mastered choosing the correct glass for your beer and how to pour it into that glass, it is time to learn how to evaluate how your beer appears. We will cover this important topic next Friday in Lesson #2 of The Beer Guy’s Beer School. Until then, hone those pouring skills and impress your friend with your new-found proficiency. I told you it was coming! Here is the ‘I Know Jax‘ Beer Guy segment featuring special New Year’s Eve brews! Be sure to catch all the Beer Guy segments on ‘I Know Jax’ Saturday and Sunday nights at 9:30 on CW17 in Jacksonville. With Christmas less than a week away, you may be looking for some special brews to enhance your holiday enjoyment. Watch my Holiday Beer Round-Up from ‘I Know Jax,’ which airs on CW17 in Jacksonville every Saturday and Sunday night at 9:30 p.m.
Be sure to watch for our New Year’s Eve beer suggestions coming soon! Last year during my Holiday Beer segment on ‘I Know Jax,’ I talked about the history of holiday beers. FOr those who may have missed it, I have reposted the video here. This year’s Holiday Beer segment airs Saturday, December 14 & Sunday, December 15 at 9:30 p.m. on CW17 in Jacksonville. For those of you outside of the Jacksonville, Fla. area, watch this blog next week, I will post the new segment as soon as the show’s producers put it on YouTube. The newest episode of “I Know Jax” with me, The Beer Guy, is out. View it here and now! Joe Talentino, the producer and host of I Know Jax, have so much fun shooting our Happy Hour segments. Last Saturday night we talked about “lawn mower” beers. In particular, pilsners. Take a peek and see how it went.